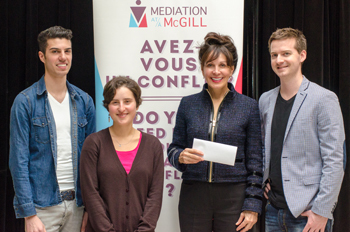 Mediation at McGill (mediationmcgill.org), a community mediation initiative run by law students, recently received a generous donation of $2,500 to support its activities. The gift was made by Me Eric Cadl, Me Douglas Mitchell (BCL’88, LLB’88), Me Odette Jobin-Laberge, the Hon. Louise Otis, and Me Sylvain Lussier, five Montreal practitioners who are among the authors of the book Recours et procédures en appel, which received the Walter Owen Prize. These authors generously decided to remit their share of the award to Mediation at McGill. Adjunct Professor Louise Otis (2nd from right), herself a well-known mediator and arbitrator who acts at the group’s advisor, was at the Faculty last week to officially give the cheque to Mediation at McGill members Colin Bourrier, Maya Smith and Jonathan Elston. Mediation at McGill offers free and confidential services in conflict coaching and mediation to help individuals resolve their conflicts.